The day Mike and Kelly arrived to help me move, I could have been packing more of my stuff. But I was so overwhelmed instead I fell back on what relaxes me and helps me center: I went into the kitchen and made something up. I knew we would have to have good vegan fuel for all the work before us, so I baked us some sweet potatoes, made us a batch of Susan’s Barbecue Black-Eyed Pea Burgers, and made sure I had an avocado and fresh collard greens from our Farmer’s Market to wrap them in. And we needed something special to splash on salad or grains. And thus this dressing was born. 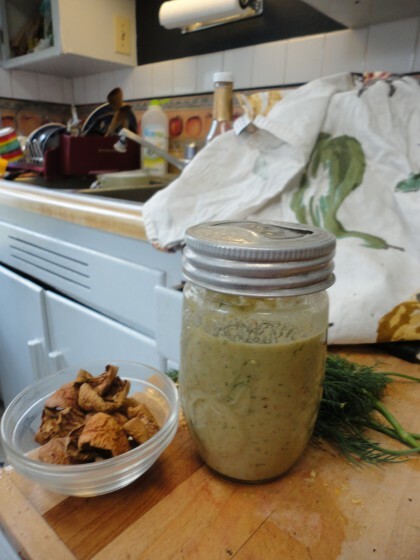 So here is the strategy for the dressing that brightened our salads and grains from the old neighborhood over to the new. I didn’t actually measure when I made this, so these amounts are approximations, based on the proportions in my Lemony Pear Dressing with Herbs de Provence recipe. I think I used more mustard, and no nutritional yeast in this one. And walnuts instead of or in addition to a very small amount of flax seeds. Memory is not serving up all the details very accurately, but hopefully you’ll get the gist and can play with it to your satisfaction. Place the apples in a small pyrex dish or canning jar–something that can take hot water being poured into it. Heat the water in the tea kettle and when it comes to the boil, cover the apple pieces with it. Let them soak for at least 10 minutes to soften up. I often let them soak much longer, since I start and then get interrupted or go do something else. But that way the fruit is really soft and the soaking water is sweeter. Up to you. Roughly chop the garlic or shallot (or both), and the dill. Zest the lemon. Place everything in the blender and whir it up. Pour into a jar and refrigerate. Use on salad, grains, or even as a condiment for a barbecued veggie burger. It’s good on a lot of stuff. Notes: if you don’t have dried apples, you could experiment with using about 1/2 cup of chopped apple and a lot less water. I’d add it by the tablespoon until you get it the right consistency. It can safely be said that what my professional son would call “the art department” of my blog is rather lazy and expedient when it comes to shooting photos for these recipes. I’ve not even bothered to create a simple “set” where I can photograph the food in the best setting and light to show it off. Instead, I’m mostly shoving all the spice bottles and clutter out of the way, or taking several pictures that try to mute them or leave them out as much as possible. So it surprised me when I looked at the “outtakes” for these dressing photos, and choked up to see the cheerful clutter of my old kitchen in the background of every one of them, including the recipe photo above: the pot rack bursting with pans, lids, strainers above the radio and the gardening pots full of ladles and wooden spoons; the dog walking paraphernalia near the back door, the door to the bathroom that sticks when the wood expands in the spring; the mops and brooms leaning in between the hot water heater and a small narrow bookshelf turned pantry for jars of beans and grains; the wallpaper I still love peeling a little around the light switch; laundry detergent left on top of the washer. Suddenly these things seemed sacred, inviolable, inbued now with the light of the past. I felt like a traitor to have diassembled this inefficient porch turned kitchen where so many meals and memories were created over the last 20 years. Since that time, Nolan’s Dad, who once shaved a quarter of an inch off one of the kitchen cupboards so my new refrigerator would fit under it, has passed away. Nolan is back up from Southern California, where he’s been skateboarding professionally, to help his Mom complete the home she and his Dad were building together. He’s also thinking of staying and trying out a semester at the University of Idaho. He came to help us move the big stuff and it was just like old times. So much love and laughter, so many memories, some loved ones gone, some here to welcome the new and feel the loss of the old. Here we have Apple Dill Vinaigrette with Dishes Jumbled in Sink and Dish Drainer. The light and dark blue and the apple wall paper I love so much you can see in the background were a result of Mike and another friend of his, Cody, and their candle-making experiments at age 10, which they went ahead with against instructions to wait until a friend who was taking me to the store and I returned. They nearly burned the kitchen down. When we came back their eyes were wide with shock and remorse, and there was a huge swath of smoke stain across the ceiling and walls as a result of the wax bursting into flame. I was speechless. My friend, hailing from Montana, and having two grown kids and a teenager herself, was unflappable. “The thing to do, ” she said, looking around, “is to paint the kitchen. Michael, Cody, tomorrow I’ll come get you and we’ll go to the paint store and get the paint and the wallpaper, and you’ll paint the kitchen.” And that’s how I got my light and dark blue kitchen with the apples on the walls. So, dear blue kitchen in a dear blue house, thanks for the great memories. 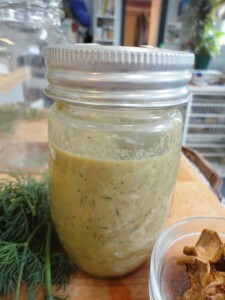 And one last wonderful inspiration for this apple dill vinaigrette. PS: Next up–what we made in the new kitchen. . . So nice to hear from you, Maria! I hope everything goes well in your new house! Thanks so much for the well wishes, Silvia! It’s nice to be “back”–even a little! Good to hear from you! I hope the move, adapting to the new house and saying good bye to the blue house all goes well and your energy stays up and carries you through in one piece. I don’t have dried apples and I don’t have mustard 🙁 so the dill will have to wait till tomorrow after I’ve gone shopping. Which is a shame as it looks and reads rather mouthwatering. Thanks, Veronique, I’m happy to have internet again and to be able to write this. I hope you enjoy the dressing, too!! Thanks so much, Kelly–it made me tear up, too. The week of moving and beyond turned out to be a very rich emotional one, both for me and my son. So neat you have nearly the same cabinetry in your house. Moving is a trade-off, and it takes a willingness to let go. Even then, the attachments and memories surprise and amaze. Your home sounds so lovely, and when it’s right you will find another in whatever place you need to be that’s every bit as lovely. I will hold that thought for you, and that others who love your old one will come along too, when the time is right. And yes, hope you enjoy the dressing too!! Sounds delicious!! 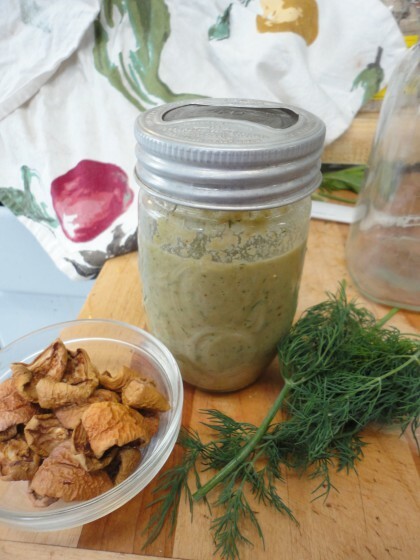 I love dill and apples, and this would be a great one to keep around for an anytime salad or bowl! The memories of a home: the cookies, the mishaps, the gatherings – saying goodbye to where it all happened, that you may never see that place again, makes you want to hold on to those memories even more. Hello! I lost the message you wrote about re-growing romaine lettuce plants and cannot find it on your website. Any chance you can send me in the right direction? A question about today’s recipe. I don’t have any dehydrated apples but I do have some granny smith apples. Would that be okay and how does it change the process to use them? Thanks! Thank you for the link. I have put one in the kitchen window and will do as they suggest. Hoping for the best! Thank you for straightening me out about using fresh apples vs. dried. I guess I missed that part in your message. I also used an apple instead of dried apples. I would wait with the lemon juice and taste first. A fresh apple is less sweet than a dried one and you want to make sure the sweet and sour balance is right. Ps: about growing the lettuce back: after a week or 1,5 the lettuce starts growing roots. You will then want to move it to the garden or a pot with some rich rich organic soil. There aren’t any nutrients in tap water which the lettuce needs if you want it to be nutritious and healthy. I do it and it works real easy. Thank you for both your helpful messages, I appreciate it. I just put my first one in the kitchen window. Unfortunately, I trimmed off the bottom so I guess it will take longer. I’ll have another one available soon and will resist the urge to trim it! The rhythm of life and a fistful of dill sure makes for a great summer’s day! While reading about your kitchen’s warmth and capers, I could hear your mom & mine smiling (yes, one can hear a smile) and humming right along to Maria.. Surely will make both dressings in a week or two. I made it with 1/3 apple s I had no dried apple. It was delicious and the guys liked it which is always a coup for me. Excellent to find sauces and dressings oil free and tasty. Thank you! Honey, if you’re going to continue to live in any kind of good health, you seriously need to add some (or a lot) of healthy oils to your diet! You scare me! Your brain, for one, is made mostly of fat. Did you know that? It needs nutrition too. Coconut oil, minimally, camelina or hemp. The diseases you’re living with could be so much smaller………..
PS: I’ve only come across a couple of your recipes and when I add an organic healthy oil, they really come to life! The purpose of my blog is to share and reflect on how an oil free low fat whole food plant based diet has changed my health and my life for the better in amazing ways. Before I began eating this way, I ate as you suggest and did not see any improvement, only decline. Once I started eating this way my health has improved to the point that I was asked to share my experience and recipes from the last several years here on the Fat Free Vegan site. I have been able to do that and much much more, as careful reading of my blog entries will show. I am committed to this way of eating and the science that supports it. I hope you can respect that this is not the place to insist that I or anyone else add oil to their diet in order to be healthy. I won’t be approving any more comments that insist on dietary recommendations that undermine the purpose of my blog.